As part of the Frontier Technology Livestreaming launch event at DFID on London’s Whitehall, UAVAid was delighted to provide the UAV demonstration component. The event was focused on the launch of the IDS report > click here to download the report < investigating Frontier Technologies for International Development, and ‘drones’ generated alot of interest in particular. Based in the atrium area, UAVAid displayed their Proof-of-Concept humanitarian (2015) demonstrator UAV, with supporting delivery, surveillance and mapping footage on a large screen and banners. The team were delighted to have the opportunity to meet and discuss the project with DFID staff and invited guests. 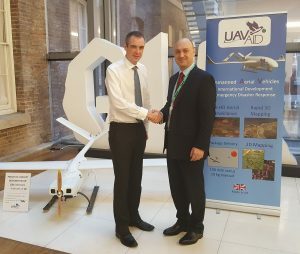 Further, Daniel Ronen briefed Parliamentary Under Secretary of State for International Development, James Wharton MP, on the opportunities the UAVAid system would present for NGO’s, governments and humanitarian actors in response and development contexts.